Both variants deliver flawless, irreproachable handling and ride quality, wrapped in a centerfold-worthy body. It’s the Quadrifoglio that makes Giulia so fascinating, consuming every ounce of automotive emotion in my body. 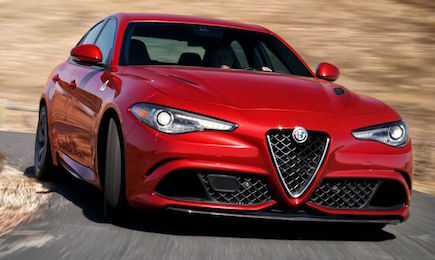 Front and rear bumpers are short, body panels stretched tight across its muscular frame, the sloping hood beautifully connects to Alfa’s signature V-shaped grille, easily making it the best-looking vehicle in its segment. Inside, it is nicely designed — with a thick steering wheel with an excellent feel – but some of the operating controls are fussy and there’s some economy-looking plastic trim. Seats are heavily bolstered, yet comfortable, with ample adjustment options. Standard equipment is substantial: 8.8-inch touchscreen with navigation; leather seats, dash and upper doors; genuine carbon fiber trim; and a full complement of advanced safety features. While its immense horsepower and rocket-sled acceleration is more than impressive, what really stands out is the sports-car precise, trigger-fish handling. It corners flat with virtually zero body roll. The steering is the best I’ve experienced, and the eight-speed automatic transmission is nearly perfect, especially when “dynamic” or “race mode” settings are engaged. Road noise is muted, visibility excellent. If we had one complaint it’s that the powerful and precise Brembo brakes were much too sensitive, throwing occupants forward even with the slightest touch of the foot. The Giulia is a lodestar of desire for those willing to forego following the crowd by choosing the cliché luxurious, subjacent sedans from BMW, Audi, and Mercedes-Benz. Those who carve their own path with the Alfa Romeo will be more than well rewarded.